The aroma of flapjacks baking in your kitchen oven brings back memories of simple childhood treats. Healthy, wholesome and made from 3 natural ingredients,Oats,Butter and 100% Pure Maple Syrup a lovely treat for anytime of the day. 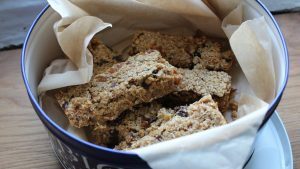 So easy to make and a great way to introduce little ones to home baking, or if you have to make a quick treat for last minute visitors, giving you a perfect result every time. Best of all this recipe is sweetened with the delicious goodness of pure maple syrup. Preheat the oven and line the tin with parchment paper. Mix all the ingredients well and put into the prepared tin. Using the back of a spoon, flatten the mixture in the tin. After 20 minutes of baking, check that the edges are lightly browned and remove from the oven. Allow to cool for 10 minutes and mark into 10 squares while still warm. Cool completely before turning out onto a board and cutting into squares.